Wind Turbine Hosts Love the Money! but…..Hate the Wind Turbines! When STT cranked into gear in December 2012, hammering the wind industry was a fairly lonely occupation: hardly fashionable; a bit like wearing yellow to a funeral, really. Back then, openly questioning the “wonders” of wind power was a guaranteed dinner party showstopper. Nervous hosts – choking on their organic pinot gris – would seek to segue to another less contentious topic – the joys of dancing cat videos, say; tempers might flare, among raised voices one of the more passionate would shout something about: “the science is settled man”. The protagonist asserting that dreaded CO2 gas was an obvious planet killing “problem”; to which the only “solution” was carpeting the world in an endless sea of bat-chomping, bird slicing,blade-chucking, pyrotechnic, sonic-torture devices – not that the wound-up wind power advocate would have ever presented, let alone dealt with, minor issues like those, as part of his “we’ve gotta save the planet” manifesto. Now, people with a modicum of intelligence – anything like an inquisitive nature; and gifted with a shred of logic – are able to unpick the fraud in several easy steps. Indeed, in discourse among those with an adult’s mental capacity it’s no longer a mortal sin these days to express the bleeding obvious: THESE THINGS DON’T WORK. On the contrary, calling the great wind power fraud for what it is has become fashionable: for want of a better phrase it’s “the new black”. For a look at the latest fashion trend, we’ll start off with this cracking article from STT Champion, Graham Lloyd, which struts the catwalk with the self-assured style of Claudia Schiffer. Each morning fine-wool grower Ann Gardner broadcasts her wind farm woes to an unreceptive world. 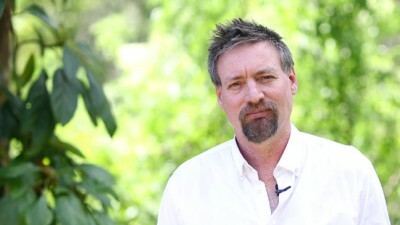 Politicians, shock jocks, journalists and anyone Gardner hopes will listen are included as recipients of uncomfortable missives that outline the “torture” of living next door to Australia’s biggest wind farm at Macarthur, Victoria. Gardner is used to being ignored, unlike her neighbours, Hamish and Anna Officer, who routinely are quoted as model wind farm devotees. Last week, as the deadline counted down for the revised renewable energy target agreement to be finally approved in federal parliament, the Officers again were displayed prominently on the front page of Fairfax newspapers rebutting the comments of Tony Abbott that wind farms were noisy. As the Officers’ immediate neighbour, Gardner thinks she, too, should have been asked by Fairfax papers about the noise. If she had been, the Fairfax reports could have disclosed that the Officers receive an estimated $480,000 a year for 25 years for hosting 48 turbines. And, a Senate inquiry has been told, after spending lavishly on renovating their Macarthur homestead the Officers will soon be moving on and leaving their wind turbines behind. The Officers, no doubt, have good reasons for moving. And the facts can easily be construed to suggest Gardner is simply jealous about the good financial fortune of her neighbours thanks to big wind. But other evidence to the Senate inquiry from wind turbine hosts Clive and Trina Gare, who say they bitterly regret their decision to host turbines because of noise, undermine the widespread claims that only jealous neighbours have a problem with wind farm noise and health. Gardner contends the failure to report the plight of the Gares or the full picture for the Officers is typical of the one-sided treatment the wind turbine issue has received. She says much of the media has shown itself willing to misconstrue findings from the National Health and Medical Research Council and suggest research had cleared wind turbines of ill effects. In fact, the NHMRC said only limited, poor-quality research was available and the issue of wind farms and health remained an open scientific question. The NHMRC has called for tenders for targeted research with a particular focus on low-frequency noise and infrasound. 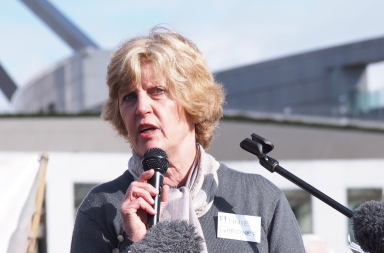 After receiving evidence from more than 500 people, the Senate inquiry, chaired by John Madigan, this month released an interim report recommending urgent steps to improve scientific knowledge about the health effects of wind turbines. This includes the creation of an independent expert scientific committee on industrial sound to provide research and advice to the Environment Minister on the impact on human health of audible noise (including low frequency) and infrasound from wind turbines. The Senate committee also calls for a national environment protection (wind turbine infrasound and low frequency noise) measure. It says to get access to the billions of dollars’ worth of renewable energy certificates, wind farm projects would have to adhere not only to the national wind farm guidelines but also with the National Environment Protection Measures. In its deal to secure passage of the revised RET through the Senate, the federal government agreed to some of the Senate committee’s key interim demands. Federal Environment Minister Greg Hunt says the agreement with the crossbench senators includes the appointment of a wind farm commissioner to receive complaints, make inquiries and to make appropriate findings. The Clean Energy Council says it is “disappointed about moves to introduce further red tape on the wind sector, given the stringent and robust regulatory framework already in place for wind energy in Australia”. However, CEC chief executive Kane Thornton says the industry will “work closely with the government to ensure these measures genuinely improve the regulatory framework and are developed based on credible scientific research by independent expert bodies”. The issue of wind farms and health is not confined to Australia. The executive board of the German Medical Association is considering a motion from this year’s national congress calling for research on infrasound and low-frequency noise-related health effects of wind farms. Like the NHMRC, the German Medical Association congress motion says there are no reliable and independent studies. “Consequently, there is no proof that these emissions are safe from a health perspective,” it says. Japanese researchers who have measured the brain waves of people exposed to noise from wind turbines have found “the infrasound was considered to be an annoyance to the technicians who work in close proximity to a modern large-scale wind turbine”. And a new study by researchers from Oxford University’s Centre for Evidence-Based Medicine have found “the odds of being annoyed appear significantly increased by wind turbine noise”. The research, published in Environment International, has found wind turbine noise significantly increases the odds of experiencing sleep disturbance, and results in lower quality of life scores. The evidence flies in the face of wind industry claims that complaints have been confined largely to Australia and English-speaking countries where vocal lobby groups have reinforced each other’s dissatisfaction. In fact, as Australia prepares to ramp up construction of thousands of new wind turbines to satisfy the RET, governments elsewhere are cutting back because of concerns about the cost and social cohesion. The Finnish Energy Industries Association says the incoming government there effectively has “shut the door” on new wind farms. Britain’s conservative government has pulled the brake on the UK’s onshore wind industry by closing its subsidy scheme a year early. The move reportedly will stop about 2500 proposed turbines in 250 projects from being built. Family First senator Bob Day, deputy chairman of the Senate committee that is undertaking public hearings, says in at least 15 countries people from all walks of life have come forward complaining about the health effects of wind turbines. The complaints include nausea, blurred vision, vertigo, tachycardia, high blood pressure, ear pressure, tinnitus, headache, exacerbated migraine disorders, sleep deprivation, motion sensitivity and inner ear damage. Current thinking is that the low-frequency noise impact from wind turbines is felt most acutely by people who are susceptible to motion sickness. Publicly, the wind industry has an army of supporters ever ready to rubbish claims that wind farms can have any effect on health. But there is evidence the wind industry has known about the impact of infra­sound for more than two decades. The first documented complaints were made in 1979 by residents living 3.5km from an old model wind turbine in the US. The residents described a “feeling” or “presence” that was felt rather than heard, accompanied by sensations of uneasiness and personal disturbance. The “sounds” were louder and more annoying inside the affected homes, they said. NASA researchers found the wind turbine operation created enormous sound pressure waves and the turbine was redesigned from downwind to upwind, swapping the blade location on the tower. The author of the NASA research, Neil Kelley, tells Inquirer modern turbines could have the same issues under certain conditions. In September 1982, the results of NASA research on human impacts was provided to the wind industry. In 1985 the hypothesis was developed for infrasound-induced motion sickness and major NASA research on community annoyance from wind turbines was released. But over the following decade wind farm noise regulations were developed that specifically avoided measuring low frequency noise. This is despite the NASA research and the fact the harmful effects of low-frequency noise from other industrial sources have been firmly established and are well understood. A federal Department of Resources, Energy and Tourism report into airborne contaminants, noise and vibration, published in October 2009, says “sound in the frequency range below 20 hertz is normally defined as ‘infrasound’ and can be heard (or felt) as a pulsating sensation and/or pressure on the ears or chest”. The common sources of low-frequency noise and infrasound are large pumps, motors or fans and crushing circuits and screens. The report says low-frequency noise can be particularly annoying and result in complaints many kilometres away from the source. And because low-frequency noises between 20Hz and 200Hz propagate with minimal attenuation across large distances and transmit easily through building fabric, “it can be quite prominent inside residences”. The report does not refer to wind turbines but it accurately describes many of the complaints that are being made. Hunt says the federal government will act in good faith on the Senate inquiry recommendations when the final report is made public in August. Done properly, the Senate committee recommendations should go to the heart of complaints being made by wind farm neighbours such as Gardner. They want real-time monitoring of noise, including low frequency and infrasound. And if limits are exceeded they want the turbines shut down, particularly at night. One thing is certain: when the wind farm commissioner takes up the position there is a good chance they will be receiving plenty of correspondence from Gardner. That Graham Lloyd has the temerity to present those kind of facts – against the run of the drivel dished up by the struggling Fairfax stable and the ABC’s “Ministry of Truth” (see our post here) – might be seen by some as “controversial”; and, by the wind industry, its parasites and spruikers, as an “outrage”: STT, however, simply calls it journalism. And it’s that kind of journalism that has started to educate the dinner party dimwits referred to above. In the last couple of months there has been a monumental shift in the attitudes and responses among those commenting on newspaper websites, blog forums and the like. No longer do eco-fascist fantasists get a free run. Instead, they’re rounded up with what they hate most: FACTS. Quite often the ‘debates’ on comments pages and web forums about the ‘merits’ of wind power get pulled to a conclusive halt with links from STT, used in a “put-that-in-your-pipe and smoke it” moment. Call it an “awakening”; call it a “fashion trend” – or whatever takes your fancy – but it’s real, and irreversible. As we’ve pointed out before, in our travels we’ve met plenty of people that started out in favour of wind power and turned against it. But we’ve yet to meet anyone who started out opposed to wind power, who later became a supporter. $10,000 per turbine per year. Now that’s what I call easy money. Largely provided by the gullible taxpayer. The whole wind energy thing is a complete farce – that will eventually turn into a disaster. The only way these monstrosities make money is because of government subsidies – on their own, they can never generate sufficient income to be profitable. It is therefore blindingly obvious what will eventually and inevitably happen: one day the government subsidies will stop, because future governments will logically decide that this folly can no longer continue and that the pointless expenditure of public funds must cease. That is when things will get interesting. As soon as the government subsidies cease – all the companies that own the wind turbines will immediately go out of business. So what then happens to the thousands of wind turbines scattered across the country side? Well, the first thing to determine will be this: who owns them? The company that has gone out of business? The banks and other financiers? The farmer whose land the wind turbine is on? The State? That question in itself will keep legions of lawyers well fed for years. But the next thing to determine is even more important: who is responsible for their maintenance? Because an unmaintained wind turbine is a disaster waiting to happen – eventually a strong wind will make it turn at the speed of an aircraft propeller – and if it hasn’t been maintained for a couple of years, it will suffer from terminal friction and burst into flames. Which is not what you want on a scorching Victorian summer day with a temperature of 45C and with a 50 knot wind. Just one of those wind turbines, on such a day and in such a condition, spewing flames, molten plastic and molten metal on to the long, dry grass below, could be responsible for the next Black Saturday. Who will be sued for hundreds of millions? The banks? The farmer? The state? All of these questions and issues are just a-blowin’ in the wind. 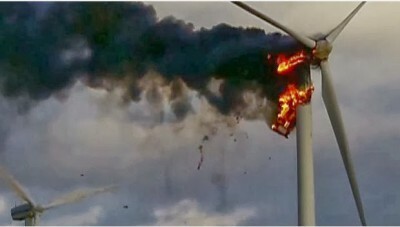 Wind energy – “works” SEVEN hours a day with a capital cost of FOUR times base load power is now considered to be unsafe. Reminds me of Victoria’s State Electricity Commission business model which was to provide Safe, Cheap and Reliable energy. Wind energy promoted by the Renewable Energy industry, politicians and the MSM is quite obviously Unsafe, Expensive and Unreliable. Yep we got rid of those who understood the energy business like the SECV which planned 20 years into the future whereas today planning only extends to the next election creating industry uncertainty as politics discard our previous safe, cheap reliable power and for what? A few Green preferences. Hmmmm…. Not a lot of support for “wonderful, free wind energy” being expressed there. And no apparent hesitance amongst the correspondents in hammering the greatest economic and environmental fraud of all time. Now, back to Graham Lloyd’s article. Graham raises the story of Hamish and Anna Officer – who are pitched up by the wind industry as the happiest turbine hosts on earth. Well …. not quite. As Graham points out, the Officers have – with all the personal integrity of Judas Iscariot – pocketed their 30 pieces of silver; destroyed their community into the bargain; and are all set to leave their long-suffering neighbours for dead. Here’s some more detail on the Officer’s fine community spirit and moral integrity in this letter from Annie Gardner to 2GB’s Alan Jones. Our neighbour, turbine host of around 40 turbines (this is an approximate number as we are not sure of exact figures) Mr Hamish Officer, who gave evidence at the Portland Senate Inquiry hearing on 30th March – omitted to inform the Senators in this hearing that he and his family will no doubt soon be moving off their property Brandon, where they host turbines to a new property which they purchased quite some time ago and on which they are building a new, very substantial home. During the Planning Panel for the Macarthur wind farm in 2006, the Officer family denigrated the many neighbouring families objecting to their proposal, claiming they would be happy to build their new dream home and live amongst the turbines. We were described as “mad” by the locals for objecting and were told there would be “not as much noise from the turbines as an ordinary working farm”. Several years ago, we heard that the Officers had purchased several hundred acres about 30 kilometres from the Macarthur wind farm where they host around 40 turbines. This is where they planned to build their new “dream home” ….. However, in recent years, the Officers have spent megabucks, renovating their homestead on the wind farm – this home is absolutely beautiful now – and also have, I’m informed, spent around $1 million on an equestrian horse complex. 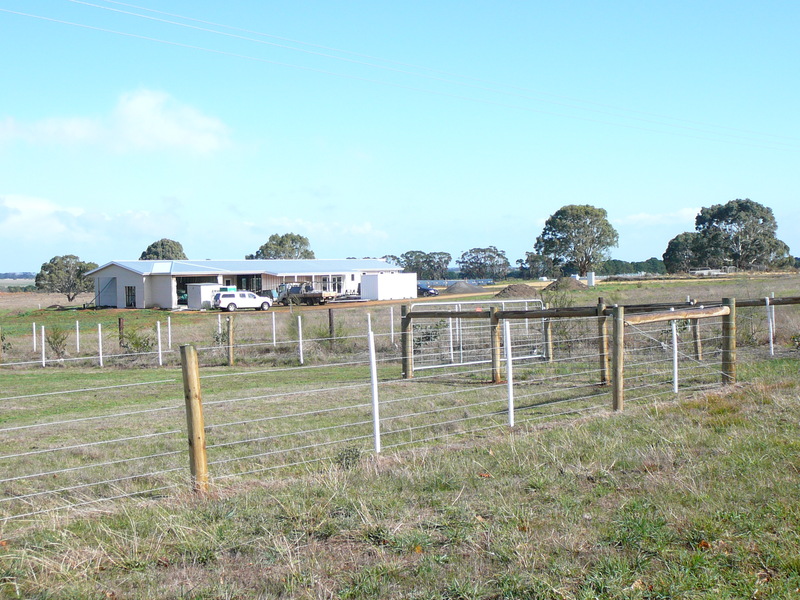 The new property which I think is a few hundred acres – it’s five minutes out of Hamilton at least 30 km if not 35 km from the wind farm at “Brandon”. I drove past the new property some weeks ago and the house is nearly finished. They’ve begun building a horse complex close to the road, and the new house which they’ll move into very soon I’m told, is quite close to the road, which surprised me. It’s relatively large, maybe 35 squares, but I had expected it to be more grand…. After all, we’d heard for years they were going to build their dream home, possibly $1-$2 million worth and whilst very nice and quite substantial, this didn’t quite fit the picture. BUT, recently we were told this new house into which they’ll move soon, is only where they’ll live whilst their far grander “dream home” is being built further back into the property!!!! In his evidence to the Senate Inquiry on 30th March in Portland, Mr. Officer claimed “There are not a lot of people who actually live and work in amongst turbines so that is why I am here today …. My experiences so far have been very positive”. If that is the case, then why are the Officer family moving 30 kilometres away from the turbines? People have heard that their two young daughters have admitted that the turbines are “terribly noisy”. We’ve also heard their move is to be closer to education, but the truth is that there are most convenient school bus services to Hamilton College, a very fine private school in Hamilton and after all, it is most likely that the Officer children will be sent away to boarding school in keeping with the tradition on both sides of the family for several generations. In the opinion of the local people of this district Mr. Officer is guilty of misleading the Senators, by not divulging the information that he and his family will soon be moving away from their turbine host property. 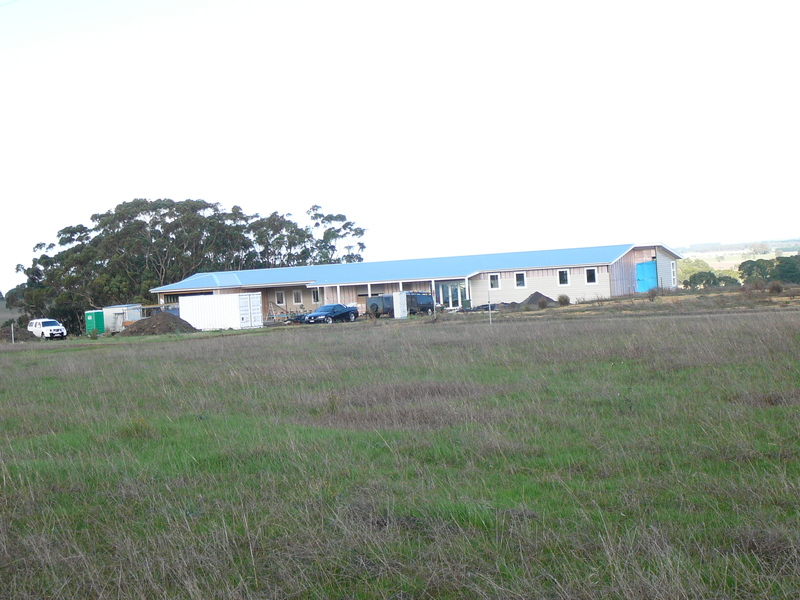 With the inevitable relocation of the Officer family from the Macarthur wind farm, the absentee ownership of one other host (they live full-time in Hamilton 35 kms away) and the situation whereby the principal host, the Robertson family own properties in Port Fairy and Melbourne which they visit regularly, and to where they could easily relocate if necessary. It appears that in reality NOT ONE of the turbine hosts, once the Officers have moved into their new home near Hamilton, live permanently on their turbine host properties. Australia, Faux-green, fighting wind turbines, Liberal corruption and incompetence., Noise & Infrasound, not financially feasible, Return to sanity! Aussies Ax, Corruption among Windies!, Devaluation of Homes, Disgusting Liberal, Dysfunctional wind turbines! ← The Public is Losing Faith in Science, Due to Bias, and Government Interference!